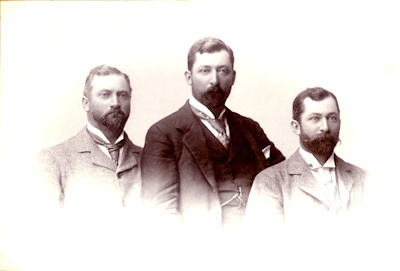 This was the often mentioned partnership formed by the three surviving Benitz brothers in which they pooled their enterprises while they reorganised. They drew up the articles of their company on April 1, 1897, in Rosario, Santa Fé. The contract itself was not recorded until April 28, 1897. The partnership was supposed to last five years. It dissolved sooner than that. As noted in the contract, the brothers had, earlier on April 1, 1897, bought out their mother (Josephine Kolmer-Benitz) and their sister (Josephine Benitz-Schreiber). This copy of the contract is from John E. Benitz’s papers which his grandson, John C. Benitz, graciously allowed us to scan in 2003. Number forty three: In the city of Rosario, Santa Fé, on the 1st of April, 1897. 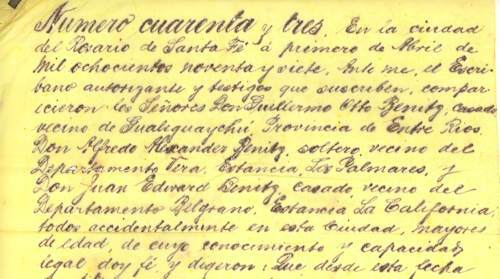 Before me, the authorizing notary and witnesses, are present Don Guillermo Otto Benitz (married, of Gualeguaychú, Entre Rios province), Don Alfredo Alexander Benitz (single, of estancia Los Palmares, Department of Vera), and Don Juan Edward Benitz (married, of estancia La California, Department of Belgrano)… Who on this date form a joint partnership that will benefit from livestock and other related operations of three estancias namely “La California”, “Los Palmares” and “Los Algarrobos” located the first in the parish of Los Esteros, department of Belgrano, the second in the department of Vera, both of this province, and the third in the parish of Saladillo, department of Union, province of Córdoba. Second: The three brothers are joint equal partners. Third: The management is the responsibility of the all three partners, each for his estancia…. Fourth: Each partner may use the firm but not for activities unrelated to it; and in the case of taking on a mortgaged debt the interest may not exceed 6% per year and all partners must consent in writing to the mortgage. Fifth: the firm is worth 2,145,413.53 pesos legal tender…. owned equally between the partners; as compensation for expenses, etc. Alfred Benitz is credited with 500 pounds sterling, John Benitz is credited with 1,200 pounds sterling and William Benitz is debited the total of both. [There follows a legal description of the properties previously owned by the entire family:] First: “La California” … 5,196 x 15,588 meters (= 8,100 has., includes “Las Tijeras”); Second: “Los Algarrobos” … 101,468,000± sq. meters (= 10,147 has.) which have been duly sold, transferred, etc. to you by your mother (Doña Josefina Colmer de Benitz) and sister (Doña Josefina Benitz de Schreiber) on this same date. Sixth: The partners may withdraw for their personal use 500 pounds sterling (2,500 pesos gold) per year; to withdraw more requires the consent of the other two and will be charged to their current account at 8% interest. Seventh: None of the partners are permitted to enter into any business transaction on their own account; if entered, all profits got to the company, all loses to the partner’s account. Eighth: Profits and loses will be shared equally. Ninth: The company will exist for five years, that is from today to the same date in 1902. Tenth: None of the partners may make a withdrawal from earnings, if any, that are not described in the Sixth clause. Eleventh: The legal Balance Sheet will be drawn up on 31 December of every year. Twelfth: Regardless of any other member meetings, every three months a meeting will be held to discuss and review the progress of each enterprise and make any proposals deemed necessary, which will be recorded and signed by all partners. Thirteenth: The company will continue regardless of whether a partner dies, is incapacitated or absent for any reason. Fourteenth: If Thirteen should occur, the remaining partners must decide the fate of the company; if dissolved, the inheritors or their representative are to be paid their share in equal parts at one, two, three and four years without interest. Fifteenth: If a partner should die, the surviving partners must, within 15 days, provide the widow or inheritors 1,000 pounds sterling, equal to 5,000 gold pesos, enough to survive on until the company is dissolved. Sixteenth: Should there be two surviving partners, the company can not be dissolved for the sake of paying the inheritors their share without first obtaining the consent of those partners. Seventeenth: Once the future of the company has been decided upon, in the case of one or two partners dying, etc. their representatives may not interfere in the management of the company. Eighteenth: The partners agree they will not make bank transfers (or other bank transactions) themselves, but instead will go through their (accounting) office in Rosario, with 3 days notice; this is to avoid possible harm to the company. Twentieth: Upon dissolving the company, and after paying all debts, a mutually agreed upon appraiser will create three equal shares, each share assigned to a particular partner per common agreement. Closing statement: Income tax number & payment received (1,500 pesos m/n) by the notary, signed, sealed, and delivered. Present: E.P. Balestre (Las Rosas receptor); witnesses: Leslie G. Barnetts, and Baldomero Sotelo, both of Rosario; Guillermo O. Benitz, Alfredo Benitz, Juan Benitz; and Moises Garcia (notary public). The contract was registered 28 April, 1897, in Rosario. Various court logs and signatures.